One common weight and balance problem involves moving or shifting weight from one point to another in order to move the balance point or CG to a desired location. This can be demonstrated by using a lever with three weights to work out the problem. As the lever is loaded in Figure 2-11, it balances at a point 72 inches from the CG of weight A. Figure 2-11. Locating balance point with three weights. Figure 2-12. Proving the new balance point is correct. Figure 2-13. Weight distribution to balance lever. Figure 2-14 indicates that the shift in weight depicted in Figure 2-13 allows the lever to balance as the sum of the moments is zero. Figure 2-14. Weight shift provides correct CG. 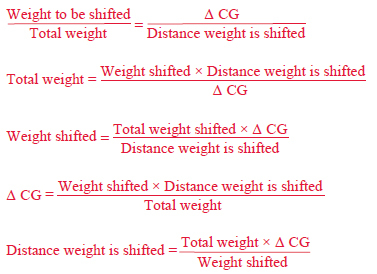 The following formulas can be used to determine the distance weight must be shifted to obtain a desired change in the CG location. The equation can also be rearranged to find the amount of weight required to be shifted to move the CG to a desired location, to find the distance the CG is moved when a specified amount of weight is shifted, or to find the total weight that would allow shifting a specified amount of weight to move the CG a given distance. The CG of the lever in Figure 2-11 was 72 inches from the datum. This CG can be shifted to the center of the lever as in Figure 2-13 by moving weight B. 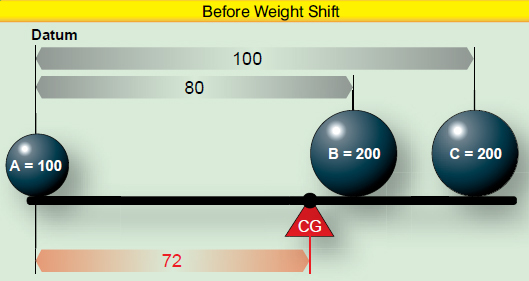 If the 200-pound weight B is moved 55 inches to the left, the CG shifts from +72 inches to +50 inches, a distance of 22 inches. When the distance the weight is to be shifted is known, the amount of weight to be shifted to move the CG to any location can be determined by another arrangement of the basic equation. Use the following arrangement of the formula to determine the amount of weight that has to be shifted from station 8 to station +25, to move the CG from station +72 to station +50. If the 200-pound weight B is shifted from station +80 to station +25, the CG moves from station +72 to station +50. A third arrangement of this basic equation is used to determine the amount the CG is shifted when a given amount of weight is moved for a specified distance (as it was done in Figure 2-11). 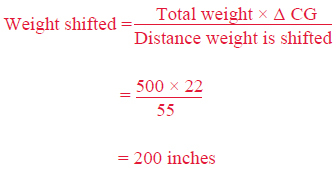 The following formula is used to determine the amount the CG is shifted when 200-pound weight B is moved from +80 to +25. Moving weight B from +80 to +25 moves the CG 22 inches from its original location at +72 to its new location at +50 as seen in Figure 2-13. To complete the calculations, return to the original formula and enter the appropriate numbers.